The research project KIRMin (funded by the federal Ministry of Education and Research) analyses the dependencies of electricity and water supply systems in Germany. It deals with system-relevant technical interfaces, e.g. at pumping stations, as well as organisational dependencies in risk and crisis management. 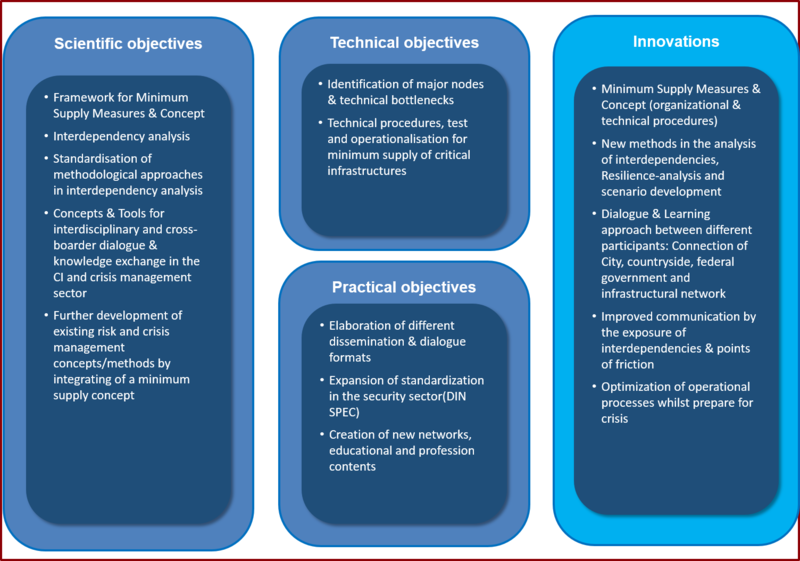 For this purpose, weak points are identified and opportunities for improvement in risk and crisis management of infrastructure operators and authorities are identified. At the same time, an analysis of the coping and recovery capabilities of the population and industry in the event of a crisis is carried out. In addition, the necessary minimum supply is to be determined in order to define protection targets as a basis for security measures. The declared aim of the three-year project is to develop innovative solutions in the form of a minimum supply concept in the event of a failure of critical infrastructures and to integrate these into crisis management together with the end users. Central questions in the project are among others: What are the requirements for ensuring a minimum supply? Which elements and processes of critical infrastructures are essential for this? Where are interdependencies? Where are there optimisation possibilities in risk and crisis management? Do the stakeholders have sufficient coping and recovery capabilities? How can integrated risk management be designed systematically and in a structured way?